Many young hockey players across the globe have dreams of scoring the Stanley Cup winning goal in game 7. Game 7s are nerve-racking for both players and fans. One win away from ultimate glory, but one goal away from bitter defeat. Mark Messier. Jari Kurri. Henri Richard. Jean Beliveau. Andy Bathgate. Gordie Howe. Hall of Famers; also players scoring the game winning goal in a Stanley Cup game 7. But, the list isn’t limited to stars. Max Talbot, Frantisek Kaberle, Ruslan Fedotenko and Mike Rupp are also on that list. But Hall of Famer or not, the player who scores the Cup clinching goal is etched into the minds of their fans forever. He’s a hero, regardless if he is a first liner or fourth liner. Some kids carried their dream further and dreamed about scoring a game 7 winner in overtime, but that does not happen in the NHL too often. The last time the Stanley Cup was won in overtime in a game 7 was 1954 by Detroit’s Tony Leswick. Leswick dumped the puck into the Canadiens’ zone, where it deflected off a defenseman and into the net. He did not even realize he had scored until he saw his teammates celebrating. So who scores the Cup clincher tonight? Twitterers threw in their opinions. The popular choice was Ryan Kesler, who @Mfreys, @DurtyPuckhead, @lyssaaaah and @TheNatch_ picked despite not having a goal in this series. @MattyTets picked Alex Burrows based on the fact that he’s been “clutch all postseason.” Burrows has 9 playoff goals, 2 of them winners, including Vancouver’s game 2 win. @Shmermel and @AngrytownsMayor chose unsung heroes, going with Jannik Hansen and Tanner Glass respectively. @Pucktacular went with the man who eliminated the Sharks, Kevin Bieska. 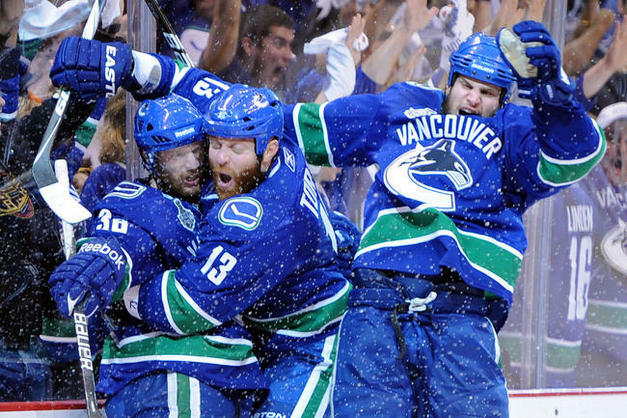 @Mtrible and @JoeyHurricane chose game 1’s hero, Raffi Torres. The Bruins got some love, though. @PhillyReign_MD said Johnny Boychuk “burns one in the twine” in the second overtime. @ActiveStick_44 picked Mark Recchi because “experience is nothing to undervalue. Recchi has it and he has all the determination in the world to come out and play like it’s his last shot at ever hoisting the Stanley Cup again. He has been in a game 7 in the Stanley Cup Final before [2006 with Carolina]. In games like these it’s not the star players that create a great story. Recchi is not one of the superstars in this series, but you can expect him to come up huge tonight.” @RobDickinsonAB went along with the non-star theory and chose Brad Marchand. @Puremetal33 picked playoff scoring leader, David Krejci (12 goals, 23 points). Who do I pick? 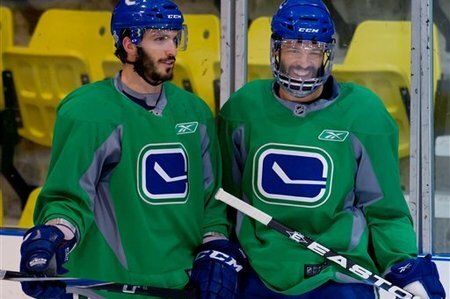 Torn between my head (Daniel Sedin) and my heart (Manny Malhotra). I think it would be a great story if Malhotra ended up scoring the Cup clincher after the rocky season he’s had. But I’m going with my head and picking Daniel Sedin. Alex Burrows might have been the star of game 2, with his two goals and an assist, including the overtime winner, but for Canucks center Manny Malhotra just playing in the game is a victory. Malhotra was enjoying a fine 2010-11 season; playing for the league’s best team, scored his 100th career goal, and posted his third straight 30-point season. But on March 16, his world was flipped upside down. In a game against the Colorado Avalanche, Malhotra took a puck to the eye. He underwent surgery the next day, and was ruled out of the rest of the regular season and playoffs. A second surgery, a week later, was performed to save his eye and vision, according to his brother-in-law, NBA star Steve Nash. At the time, it was speculated that he might have to retire because of the injury. It looked like a giant blow to the Canucks’ penalty kill, which was ranked first in the league after being 18th the year before signing Malhotra. However, as the Canucks kept advancing in the playoffs, the chances Malhotra would rejoin the team increased. In May, he started practicing, and by the end of the month, he was cleared to play in the Stanley Cup Final. He sat out game one, but Alain Vigneault inserted him into the lineup for tonight’s game two. The crowd chanted “Manny, Manny” pregame and gave him a standing ovation when he stepped onto the ice for his first shift, about two minutes into the game. After the game, he admitted the ovation made him the most nervous he has ever been in his career. He played with a full face shield, despite not using one in the regular season prior to the injury. In the regular season, Malhotra was second in the league, winning 61.7% of his faceoffs. The team missed him in game one, where they only won 44% of draws. Tonight, Malhotra went 6-for-7, and the Canucks as a team improved to 47 %. He only played 7:26, mainly on the fourth line with Victor Oreskovich and Jeff Tambellini, but contributed on the penalty kill as the Canucks held the Bruins to 1 for 7 on the man advantage. Malhotra has drawn comparisons to Ian Laperriere, who last year returned for the Stanley Cup Final after taking a puck to the face in the first round, resulting in a concussion. Fortunately for Malhotra, he isn’t suffering from a brain injury. With two more Canucks wins, Malhotra will get his name etched on the Stanley Cup, something well worth everything he’s been through this year.